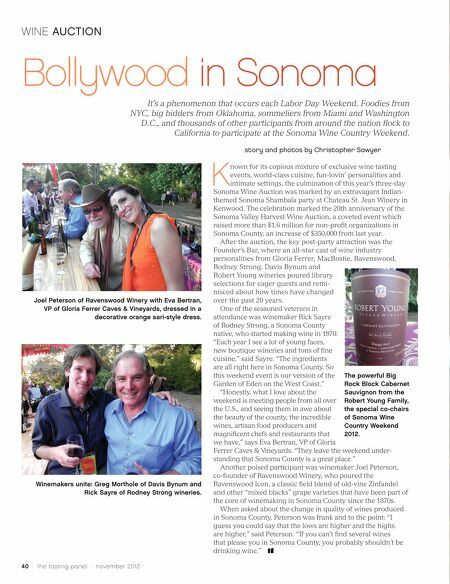 WINE AUCTION Bollywood in Sonoma It's a phenomenon that occurs each Labor Day Weekend. Foodies from NYC, big bidders from Oklahoma, sommeliers from Miami and Washington D.C., and thousands of other participants from around the nation flock to California to participate at the Sonoma Wine Country Weekend. story and photos by Christopher Sawyer K Joel Peterson of Ravenswood Winery with Eva Bertran, VP of Gloria Ferrer Caves & Vineyards, dressed in a decorative orange sari-style dress. nown for its copious mixture of exclusive wine tasting events, world-class cuisine, fun-lovin' personalities and intimate settings, the culmination of this year's three-day Sonoma Wine Auction was marked by an extravagant Indian- themed Sonoma Shambala party at Chateau St. Jean Winery in Kenwood. The celebration marked the 20th anniversary of the Sonoma Valley Harvest Wine Auction, a coveted event which raised more than $1.6 million for non-profit organizations in Sonoma County, an increase of $350,000 from last year. After the auction, the key post-party attraction was the Founder's Bar, where an all-star cast of wine industry personalities from Gloria Ferrer, MacRostie, Ravenswood, Rodney Strong, Davis Bynum and Robert Young wineries poured library selections for eager guests and remi- nisced about how times have changed over the past 20 years. Winemakers unite: Greg Morthole of Davis Bynum and Rick Sayre of Rodney Strong wineries. One of the seasoned veterans in attendance was winemaker Rick Sayre of Rodney Strong, a Sonoma County native, who started making wine in 1970. "Each year I see a lot of young faces, new boutique wineries and tons of fine cuisine," said Sayre. 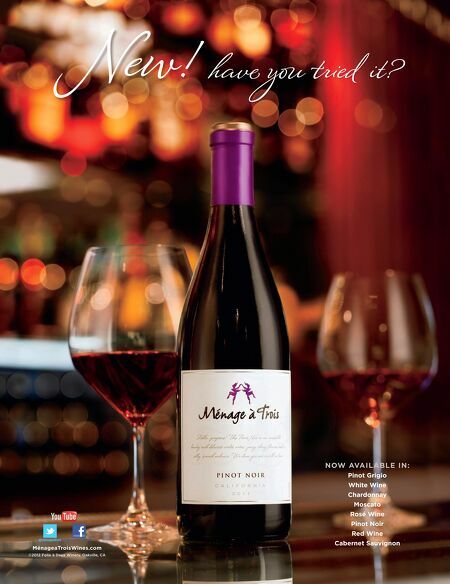 "The ingredients are all right here in Sonoma County. So this weekend event is our version of the Garden of Eden on the West Coast." "Honestly, what I love about the weekend is meeting people from all over the U.S., and seeing them in awe about the beauty of the county, the incredible wines, artisan food producers and magnificent chefs and restaurants that we have," says Eva Bertran, VP of Gloria Ferrer Caves & Vineyards. "They leave the weekend under- standing that Sonoma County is a great place." Another poised participant was winemaker Joel Peterson, co-founder of Ravenswood Winery, who poured the Ravenswood Icon, a classic field blend of old-vine Zinfandel and other "mixed blacks" grape varieties that have been part of the core of winemaking in Sonoma County since the 1870s. When asked about the change in quality of wines produced in Sonoma County, Peterson was frank and to the point: "I guess you could say that the lows are higher and the highs are higher," said Peterson. "If you can't find several wines that please you in Sonoma County, you probably shouldn't be drinking wine." 40 / the tasting panel / november 2012 The powerful Big Rock Block Cabernet Sauvignon from the Robert Young Family, the special co-chairs of Sonoma Wine Country Weekend 2012.